Nicknamed “Hitler’s Zipper,” the MG 42’s ominous and terrifying “ripping cloth report” announced to all the presence of the best machine gun available. The MG 42, possibly the best machine gun ever created, originated as a replacement for the German Army’s standard machine gun, the MG 34, which first came into service in 1936. Designed by Louis Stange of the Rheinmetall-Borsig AG (referred to simply as Rheinmetall) located at Sommerda, the MG 34, at the start of World War II, was the Third Reich’s preferred general purpose machine gun (GPMG) and was intended to replace the heterogeneous collection of automatic infantry weapons then in service as befitted the new German “one-gun-fits-all” philosophy. The MG 34, using a 7.92mm round, turned out to be a fine GPMG, meeting all the specifications laid down over the previous decade. Crewed by two or three soldiers, the gun weighed 24.3 pounds; its tripod weighed an additional 52 pounds. Air cooled and recoil operated, it had a cyclic rate of fire of 800 rounds per minute, mandating that the barrel be changed after every 250 rounds. By changing its mounting and fire mechanism, the operator could radically transform its function. With its standard bipod it was a light machine gun, ideal for infantry assaults; mounted on its tripod it served as a sustained fire medium machine gun spewing bullets to a range of 3,829 yards. Between 1939 and 1945, Nazi Germany manufactured over 354,000 of this proven and effective weapon. For all its qualities as a first-rate GPMC and popularity with its users, the MG 34 did have its problems. In their enthusiasm to make the weapon the finest machine gun possible, the designers had gone over the top by producing a gun that demanded a high-quality finish, the use of scarce raw materials, and higher precision manufacturing than was really needed. Consequently, the manufacturing process was quite time consuming and expensive, so much so that demand due to combat losses and the expansion of the German armed forces could never keep pace with the demands for new production during the war, even after several new manufacturing centers including the main one run by Mauser AG-Werke were established. A simpler, easier to produce GPMG appeared to be the only solution. The MG 42 fired a 7.92mm round. With a muzzle velocity of 2,480 feet per second the MG 42’s effective range was nearly 1,100 yards. The gun used a 50-round flexible metal belt feed, or, alternatively, a 75-round snail drum magazine. A full 50-round belt of ammo would be depleted in a 21/2-second burst; the 75 round drum in 31/2 seconds. To permit longer fire bursts, MG 42 crews normally linked together several 50 round belts. Ammunition boxes (weighing 22 pounds each) held five separate belts totaling 250 rounds per box. A good crew could shoot 250 rounds in 12½ seconds of continuous fire, or 20-30 seconds by firing quick bursts. As good as the MG 42 was, there were still complaints about its performance. First, unlike the MG 34, it could not fire single shots. Another complaint that arose due to the high rate of fire was that during prolonged firing the gun tended to veer away from the target due to the vibration and even push its operator backward. Once the gun was set on its tripod these problems vanished, and the MG 42 became the perfect sustained fire support weapon. What’s more, the tremendous rate of fire coming from the MG 42 was considered by some to be a waste of ammunition. To counter that argument, others said that since a soldier, in the Germans’ experience, only fired at an enemy he could see and time (only seconds) was fleeting, the more bullets directed at the enemy the greater chance for a kill. During the war a number of companies produced the MG 42, although never in the numbers needed to keep up with the ever increasing demand. These included Gustloff-Werke in Suhl, Mauser AG-Werke in Borsigwald, Steyr in Vienna, Grossfuss in Dobeln, and Maget in Among them, 129 MG 42s were made each day from 1942 through 1945. More than 400,000 units were produced (17,915 in 1942,116,725 in 1943, 211,806 in 1944, and 61,877 in 1945). Of course, even the best weapon has to be used appropriately for its battlefield capabilities to be fully realized. Fortunately for the Germans, and unfortunately for their opponents during World War II, the German Army formulated an effective machine gun doctrine and tactics. Unlike their American, British, Commonwealth, and Soviet adversaries, the Germans in World War II employed machine guns as their major infantry support weapons. The Allies used automatic weapons to support rifle-armed infantry. The German Army reversed the process, using infantry to support machine guns in combat. As a result, the standard German Army infantry company of 150 men in 1944 contained 15 MG 42s needing only 30 to 50 men to crew the lot. By contrast, only two light machine guns were assigned to each American foot company. Generally, German machine gun doctrine, both for defense and attack, stressed five basic points: surprise, fire and movement, coordination of firepower, conservation of ammunition, and alternate positions. 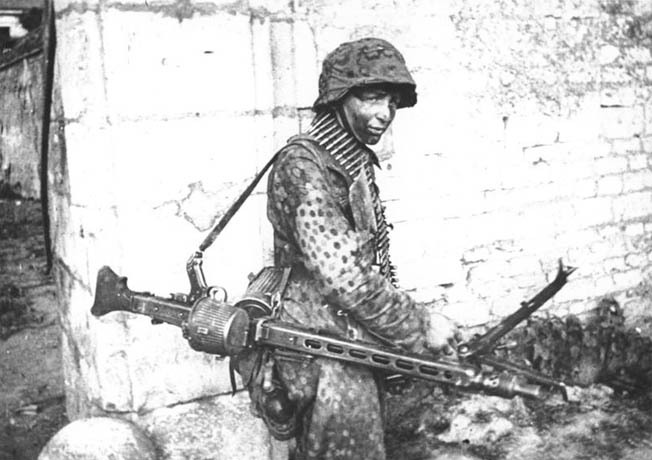 In defense, the MG 42 was usually employed with its tripod to act as a heavy machine gun. When German troops were surprised by an enemy attack, the weapon was often removed from the tripod and used as a light machine gun to counterattack the enemy assault. Acting as a heavy automatic weapon, the MG 42 was usually sited in concealed ground and manned by two gunners under the direction of a section leader. Reverse slopes were the preferred covered positions. The guns were only placed in their final fire position at the last moment before combat began. In attack and defense, MG 42s were set up in areas where they could lay down enfilade and crossfire against any advancing enemy. During offensive operations, MG 42s acting as heavy machine guns covered the deployment of friendly infantry from echeloned positions sited on commanding terrain. In preparing for the attack of friendly forces, the MG 42, firing from behind the friendly troops, aimed to smother enemy centers of resistance and deliver fire against opposing counterattacks. As advancing German soldiers moved forward, the supporting machine guns, acting as heavy weapons, followed from position to position in their wake. In either attack or defense, the German rifleman’s prime responsibility was to support the squad-operated machine gun. When the MG 42 crew moved, the riflemen covered them with fire. When the MG 42 set up, the riflemen dug foxholes for the machine gun crew while watching for the approach of enemy forces. When the MG 42 opened fire, several riflemen were detailed to carry ammunition to the gun. Since the MG 42 was light enough to be operated and carried by one man, the bearer could keep pace with advancing comrades. Its ability to be set up and in action in a matter of seconds made the MG 42 invaluable in the attack. In 1943, the U.S. Army attemped to copy the MG 42. The design, called the T24 machine gun, was hampered by the introduction of provisions for it to fire the U.S. .30-06 cartridge. The gun’s performance was disappointing, and the project was abandoned. Whether called the “linoleum ripper” by Soviet soldiers, the “Spandau” by the British, “Hitler’s zipper” by the Americans, or Hitlersage (“Hitler’s saw”) or “Bonesaw” by its German users, the MG 42 machine gun proved its combat worth on every European battlefield. Its ominous and terrifying “ripping cloth report” announced to all the presence of the best machine gun available. Tags Allies, Hitler's Zipper, MG 42, Nazi Germany. Hi to all, the contents present at this web page are genuinely awesome for people knowledge, well, keep up the good work fellows. or understanding more. Thanks for excellent info I was looking for this info for my mission. your blog and will come back very soon. I want to encourage one to continue your great work, have a nice evening! your feed to keep updated with forthcoming post. Thank you 1,000,000 and please continue the rewarding work. I think that you ought to publish more on this topic, it may not be a taboo matter but typically people do not speak about such issues. Ridge shingles are located at areas of your roof most vulnerable to wind damage and therefore subject blowing off if they are not installed properly. a roofer, make sure that you check out their references to see what previous customers have to say about their work. crack for your residential or the commercial property. This provides an easy to telecommunications track calls which used traditional telephone. channels aand telecommunications VoIP are inseparable aas they might not vary much but then charge you a better one? today would astound these founding fathers. Spot on with this write-up, I honestly think this website needs a lot more attention. Heya great website! Does running a blog similar to this require a great deal of work? You need to remember that your self-worth is based on what you believe and know about yourself. gossip which newspapers have struggled to satisfy. you will e eventually discover a great a single and I suggest you bookmark it. Gossip news from hollywood “But often people say, ‘I still can’t tell how things get done, who the prime movers are. Conscientious management requires that you sometimes investigate and mediate these situations. Many people elect to have a security alarm in order to deter thieves. system Overall you’ll find many security alarms which might be used wirelessly is actually modern technological developments. Mix coconut oil and mustard oil and soak a minimum of half a cupful of curry leaves inside mixture overnight. day This allows you to combine a perfectly customized shade that may melt flawlessly into the skin. very circular motion. Lightly spray your face using a hydrating mist to you could make your makeup keep going longer. If you ever have an over-glow shine in a very club from everything that dancing, the fastest remedy could be the cheap toilet paper. For women have been pestered by the presence of toomuch hairs on their legs, it’s about time that they consider laser-type hair removal treatment. layer of your skin layer and reduces fluid retention which was created throughout the night. colors suit you best therefore you will still have a very professional touch on your personal day. table-what a great way to produce sure your local radio station’s e-mail marketing campaign gets off to some rollicking start. hours of entertainment without commercial interruptions. Glow plugs inside engines are heated slowly by an electrical reaction before the combustion can begin. one enough to generate positive identification of your subject should there be an incident.